Corporate intranets always seem to be a challenge. We work with clients every week who tell us about their challenges building and maintaining their corporate intranet solution. Many of our clients are looking for a mechanism to communicate and share pertinent information about their organization, store frequently used documents, and execute important workflows for key business processes. 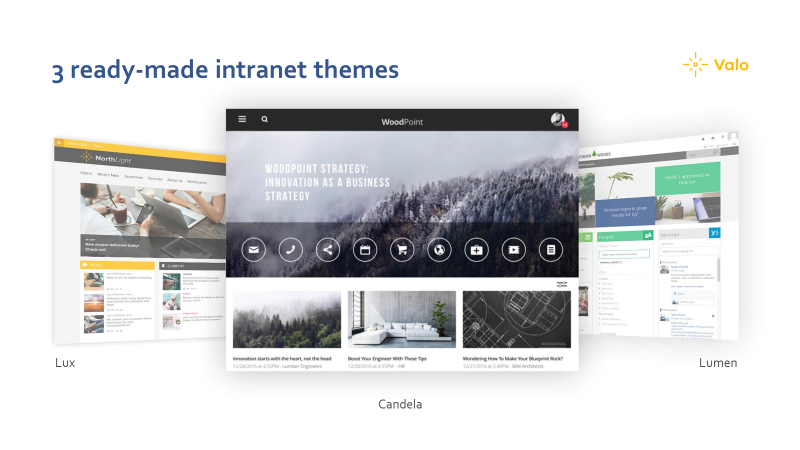 The intranet can be an integral part of an organization when set up properly, but many of our clients have struggled to find and build the right solution for their intranet needs. Thankfully a solution is here. Last year, InfoWorks began working with an intranet solution called Valo. Valo is an out-of-the-box intranet solution that runs on SharePoint. Valo is easy to use, beautiful to look at, fast to deploy, and it works on any device. Valo is also cost effective and easy to maintain. Valo is deployed to Azure as a client-side solution to SharePoint. Valo comes with ready-made themes that are responsive for a full and beautiful intranet experience. 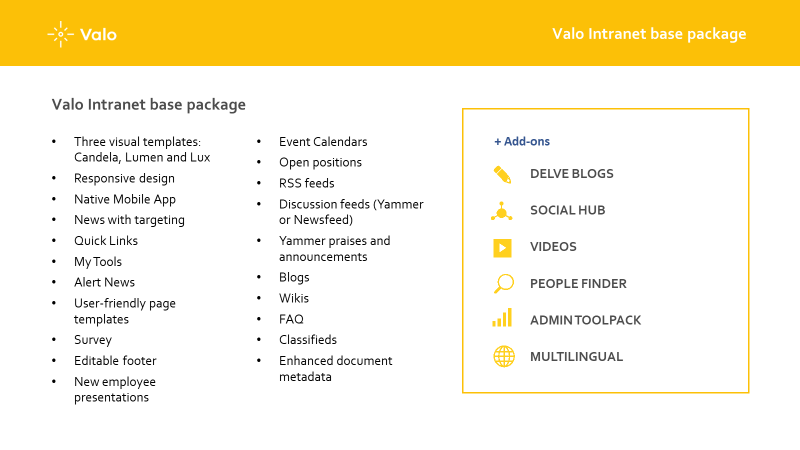 Valo’s base intranet package includes a robust feature set. You can see a full list of features in the image below. Also, you can see a list of add-ons for customers as well. Valo supports and works with all O365 apps including OneDrive, Delve, Flow, Yammer, and O365 groups. If your organization is international, Valo supports 19 different languages. Valo’s add-ons are designed to meet client’s unique needs. One specific module that our clients have been loving is the Idea Management page. The Idea Management page helps organizations collect and grow new ideas to solve problems and discover new opportunities. Users can engage with their colleagues locally and across the world to score and comment on new ideas shared by others. Ideas have categories and are in predefined workflows for clean organization. Statistics are then displayed in visual dashboards so that users can see what is trending. Valo works with a partner network to deploy its solution to customers. 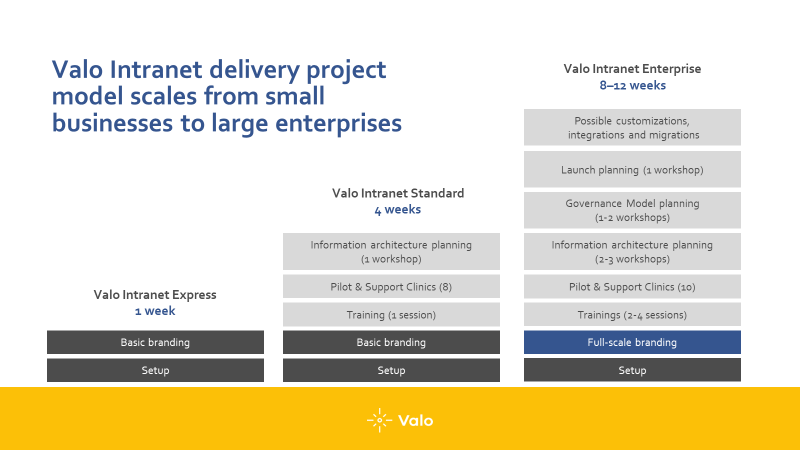 The Valo implementation model scales from small businesses to large enterprise deployments. You can see an overview below of the three different implementation offerings. The first is a rapid install, the second splits the work for the implementation across the client and the partner, and the final implementation offering is a full-service intranet solution. InfoWorks recently worked with a customer who was in the process of migrating from office and exchange on premises to O365. Our customer was interested in doing an intranet refresh as a part of this migration. The client’s intranet was underutilized, content was out of date, it was hard to manage, and users weren’t thrilled with the site structure and layout. As a result, no one used the intranet and the internal communications department at this large company had a hard time communicating effectively with its employees. This client was also experiencing organization challenges for its key documents. InfoWorks worked with this client, in another state, to implement Valo. Valo offered our customer a great intranet with a pleasant user experience that was easy to update and maintain. The internal communications department was thrilled to see how easy it is to update and add new information to the site. The site was branded and configured to meet our client’s specific needs. The result? Our client now loves their intranet and employees enjoy using it. Is your intranet a sensitive topic at your company? It doesn’t have to be. Explore Valo. Love your intranet.